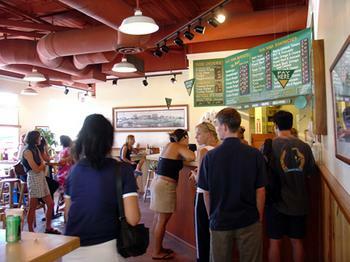 Located near the busy intersection of Auahi and Kamake'e stands Kua 'Aina Sandwich Shop. This is the "town" outpost of the legendary North Shore sandwich shop of the same name. They've been in business for over 20 years, on the North Shore, serving the same huge charbroiled burgers and sandwiches that everyone loves. In fact, they've become so popular, that in addition to this location in town, they've also set up shop in Los Angeles and Japan! and before I even get my food, the place gets to be like a sardine can! This place is extremely popular with both the locals and the tourists. On my last visit here, they didn't have any avocado...but today, I'm in luck...they have avocado! I ordered a 1/3 lb. 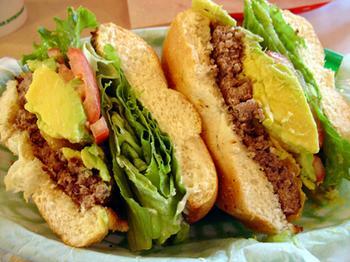 cheeseburger (with cheddar cheese) on a kaiser roll (US$6.00) and add on the avocado (US$1.10). The burger is served with lettuce, tomato, mayonaisse, grilled onions (none for me) and a carrot stick at no extra charge. The burger is charbroiled to perfection and very nicely seasoned. It's moist and juicy...and it goes so well with the fresh avocado. I also get a small order of home-made French fries (US$1.80). These are of the shoestring variety, and although I normally prefer thick, wedge-type fries, these are actually quite nice. They're very light and crisp with no added salt! 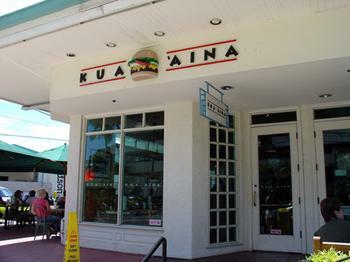 Besides burgers, Kua 'Aina serves a wide range of sandwiches such as turkey, roast beef and mahi mahi, but it's the burgers that really put them on the map. Now that I'm done, I'm already looking forward to my next visit. 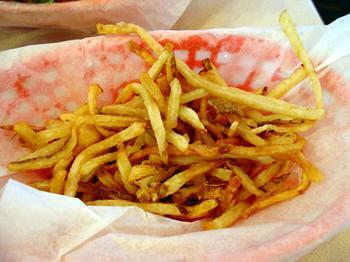 that burger really looks good and i like shoestring fries. they get soggy faster though. I second that... great looking burger! hmmm... serious craving for some ribs and burgers right now! The burger here is one of the best. Still can't beat In-n-Out though. I like these fries too, but you're right, they get soggy quickly. I have to eat them up while they're still hot. Ribs and burgers? Where can you get such things in S'pore? You need to have a backyard barbeque with all of the fixins. =) Corn on the cob, potato/macaroni salad, cole slaw...like what Stef had a while back. I love the potato wedges from Kentucky Fried Chicken...they're very nicely seasoned, although sometimes they can be a bit salty. Reid, that burger looks really awesome! Aargh craving for burgers now. Have never tried it with avacado before, but sure sounds interesting. As far as fries goes, I\'m partial to curly fries - the ones that spirals round and round. Anyone tried that? Since we\'re on fast food also, in the battle of McD vs Burger King, I\'ll take BK\'s Whopper any day. The burger is great! The avocado adds great flavor. Still, this is not the best. Are there any good burger places in Korea? As an aside...it's funny because any time avocado is included, people here normally refer to it as Californian (i.e. California roll) much as people refer to dishes with pineapple as Hawaiian (i.e. Hawaiian pizza). I do like seasoned curly fries. The fries from Jack-in-the-Box are especially good. The last time I had them was several months ago. Battle of the burgers? The Whopper's good, but I'm not really a fan of fast food in general. In fact, the last time I ate at Burger King must have been more than 3 years ago. Good burgers in Korea? Yet to come across any that\'s worthy of mention. Then again, I\'m not actively seeking them out. Anyway, I like making my own patties. I usually make them super-thick and throw in some grated cheese, browned chopped onions and garlic, herbs, red wine, salt and black pepper, and bind everything with an egg. sprinkle of vermouth on the grill yummm! I love homemade too. In fact, my homemade burgers are quite good...if I do say so myself. =P And besides, if you can make it yourself, why go anywhere to eat it right? Welcome. I had no idea about the vermouth on the grill, but yeah, you just gave their secret away! LOL! I can almost agree with you on the point of Kua 'Aina and everyone else. I mean, what competition do they really have here except for places like W&M, Teddy's, Eddie's, and the various fast food places. Now if In-n-Out or maybe even Fatburger were here, then maybe there would be some competition for Kua 'Aina. These are the best burgers EVER!!!!!!!!!! I moved from Hawaii, and I am suffering from serious withdrawal. Nothing beats their thick, juicy, flavorful burgers... NOTHING!!!!! I have to agree that Kua 'Aina burgers are some of the best in the Islands. I haven't eaten one in a while so maybe now's the time huh? We used to go to Kua Aina all the time when we went to BYU-Hawaii. We went there so much they should have name a burger after me. Some of the best burgers ever. I still dream about them. Thanks for bringing back some good memories.